Man City boss Pep Guardiola has revealed that Sergio Aguero could return either against Brighton or Tottenham having been ruled out with an injury this week. The 30-year-old has been in stunning form so far this season, scoring 29 goals and providing eight assists in 38 appearances. With that in mind, the last thing that City need is to be without his services at a decisive time of the campaign, with their Premier League title aspirations coupled with hopes of winning the Champions League and FA Cup still on the line. 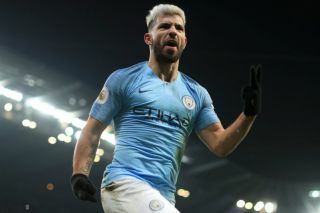 Guardiola offered the latest update on his talismanic forward in his press conference on Tuesday, and revealed that while Aguero will miss the clash with Cardiff City in midweek, the Spanish tactician is hopeful that he will return either at the weekend to face Brighton in the FA Cup or for the first leg of their Champions League quarter-final tie with Tottenham next Tuesday. The reigning Premier League champions will undoubtedly be desperate for good news in the coming days, regardless of whether or not Guardiola insisted that he was fully confident in Gabriel Jesus to step in and fill the void left behind by his teammate. That is a very significant void to fill though and with his ability to score important goals in mind, City will be eager to get Aguero back on the pitch as soon as possible as they remained locked in a fascinating title race with Liverpool and face a huge month ahead on all fronts.